So I'm obsessed with Sculptris. Its the first 3d program that truly feels intuitive and easy to use for non 3d artists. Seconds from opening the program I was making things that looked like things. All too often I find myself fumbling with commands and learning how to simply rotate the object in 3d, with Sculptris it feels natural and easy to "get" It doesn't seem like a full blown 3d solution but its fun as hell. 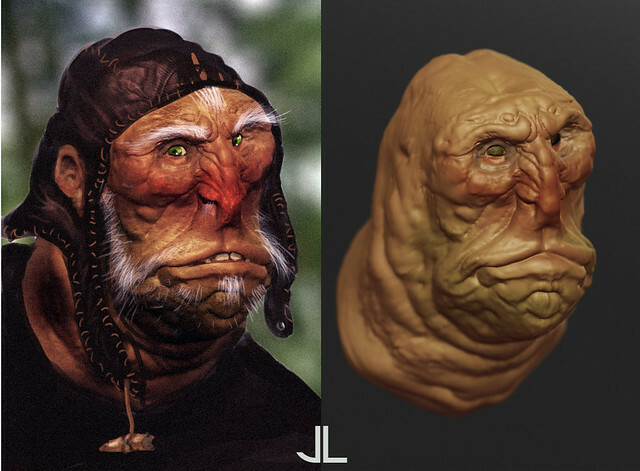 This guy took about an afternoon from Sculptris to Photoshop. You never cease to AMAZE me with your ever-growing talents. I am gathering up funds to purchase a new computer set up for Z-Brush. I would love to try the program you are using here, but Carlos informs me it is PC only. Yeah its annoying, I'm looking into getting Windows 7 on my Mac and going from there. For a free program it's pretty amazing. The guy who developed it just sold the program to Pixelogic (the creators of Z-Brush) so I'm sure we'll see a lot of the features there. Great blog. Nice to see you're living in the Boston area too!